Using Azure integration, you can manage Azure cloud products as a host of Mackerel and monitor its metrics. This function is only offered in the Trial plan and Standard plan. Each Azure cloud product will be registered as one host in Mackerel and therefore be counted as a billable host. Additionally, the API of Azure will be called every 5 minutes for each targeted metric to be obtained. Please take note, for this reason, an Azure Monitor API usage fee may occur. Currently, the following Azure cloud products are supported. For information on obtaining metrics, please refer to each individual document. Azure Integration will integrate using service principals. 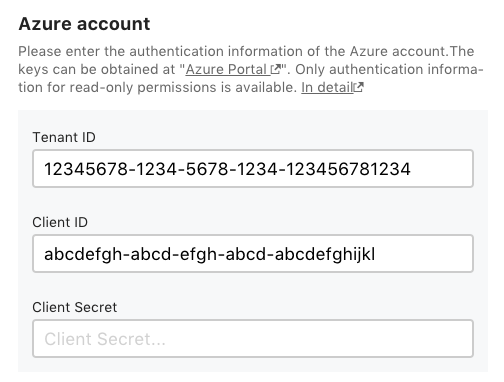 A service principal is an ID that is used to access a specific Azure resource, and is more secure than using a user ID because it has limited permissions. 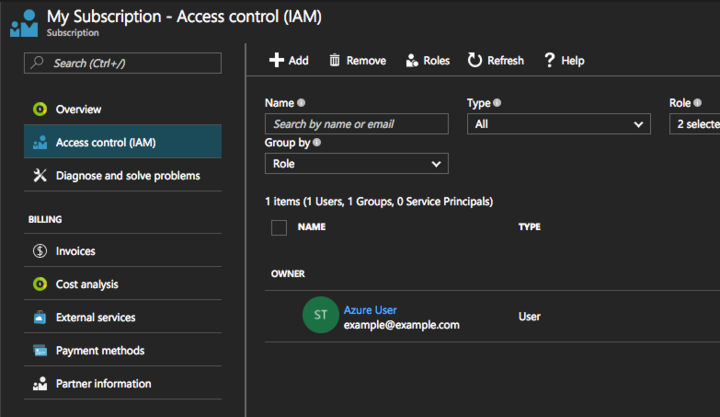 When configuring Azure integration, you’ll need access permission to do both "Create an application in the Azure Active Directory" and "Assign a role to the service principal". To confirm whether or not you have each permission, check out the items "Check Azure Active Directory permissions" and "Check Azure Subscription permissions" in the official document below. This help document will introduce how to setup Azure integration with Azure CLI 2.0 and Azure Portal. 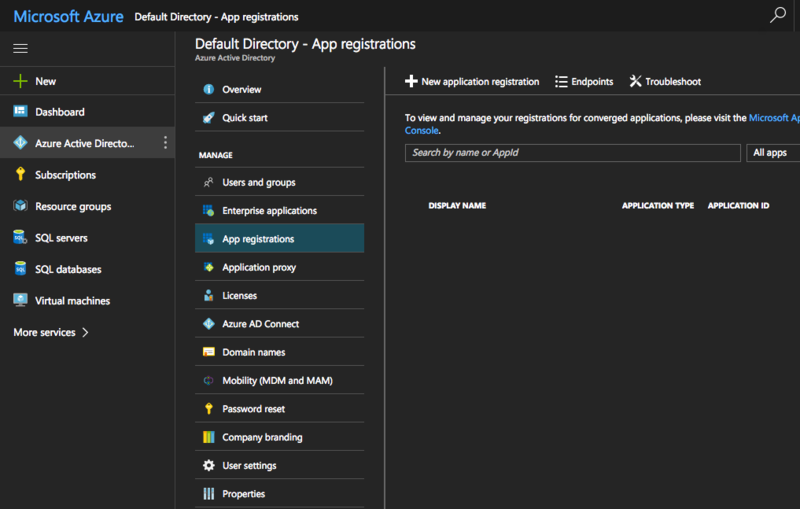 This section explains how to integrate using Azure CLI. 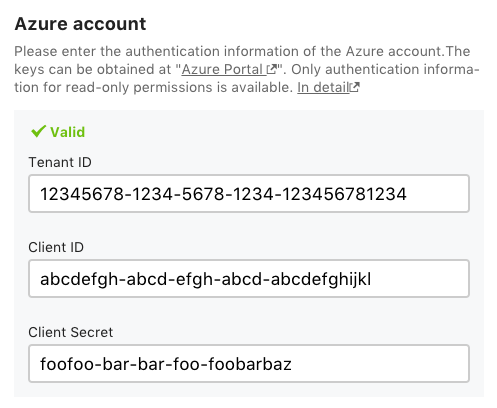 First, login to Azure with the following command. Next, use the following command to simultaneously create a service principal for Azure integration and grant viewer privileges. --years sets the expiration date of the password, with the default at 1 year. Please note that when the expiration date expires, obtaining metrics will be impossible until the password is reconfigured. Check out the following link for more about the options for create-for-rbac and more. Among the above results, configure the tenantId value to that of Mackerel’s Tenant ID, the appId value to that of the Client ID, and the password to that of the Client Secret. In addition to the Tenant ID, Client ID, and Client Secret, make sure that the region, service, and tag are properly configured from Mackerel’s configuration screen. Upon confirming the integration host, save the configuration. 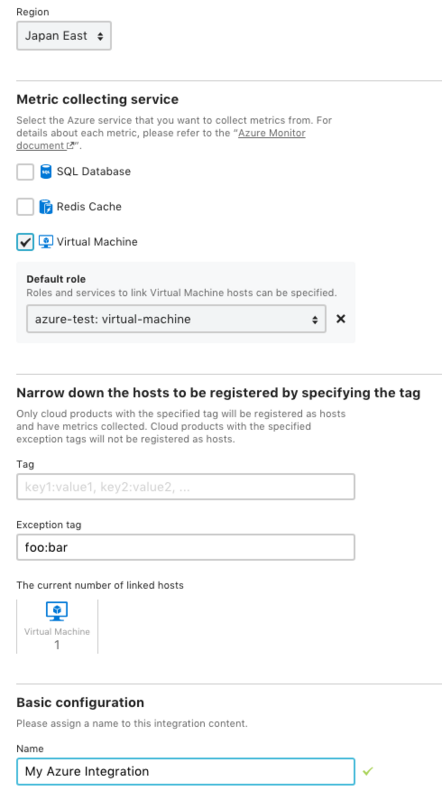 After a short while, the host created with Azure integration will be displayed in the host list. That concludes how to integrate using Azure CLI 2.0. 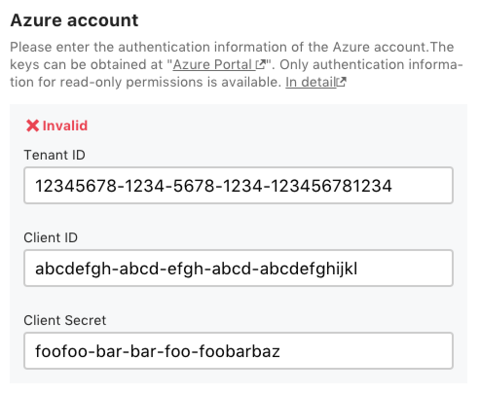 This section explains how to integrate using Azure Portal. 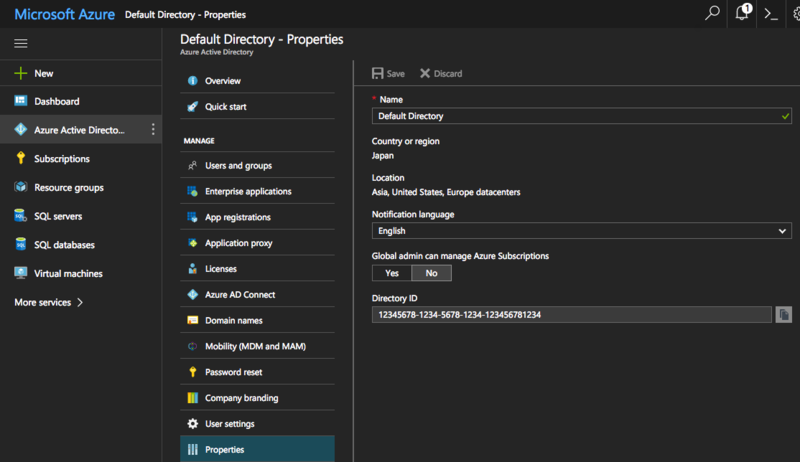 Select Azure Active Directory from the sidebar and click "Properties". 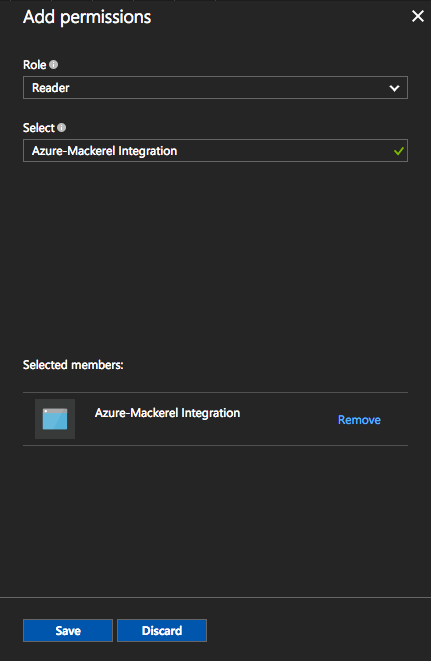 Upon selecting, enter the displayed "Directory ID" in the Tenant ID field of Mackerel's Azure integration configuration screen. 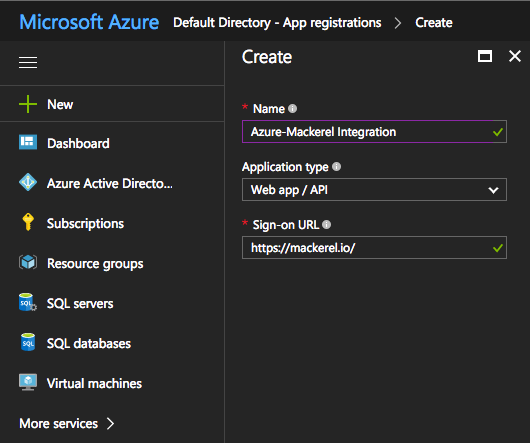 When integrating with Mackerel, an application shall be created in Azure Active Directory in order to obtain metrics through application authority instead of user authority. Select "App registrations" from the previous Active Directory screen. Next, select "New application registration" and the following screen will appear. Register the application to be integrated with Mackerel. The application name and Sign-on URL are not used in Mackerel. Specify the type of application as "Web app / API". When registration is complete, select the registered application from the previous screen. A screen like the one shown below should appear. Enter the "Application ID" in the Client ID field on the Mackerel screen. 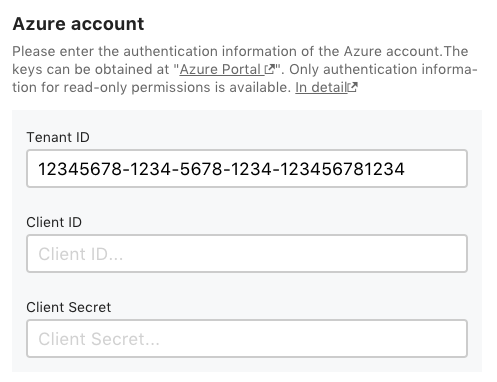 Caution If the expiration date of this key expires, it will be impossible to obtain metrics with Mackerel's Azure integration from that point on. In this case, recreate a new key. If you select "Never expires", the expiration date will not expire for a while. Although the keys have been obtained and configured with the above process, you must lastly grant permissions. Grant the permission to read metric values. Select "Subscription" from Portal screen sidebar. Then select the target subscription. Select "Access control (IAM)". Here you can configure permissions for users and service principals. Now we will configure permissions for the Active Directory application that we created earlier. After a short while, authority will be granted to the application displayed as follows. Make sure that the application displayed under "Reader" is correct. 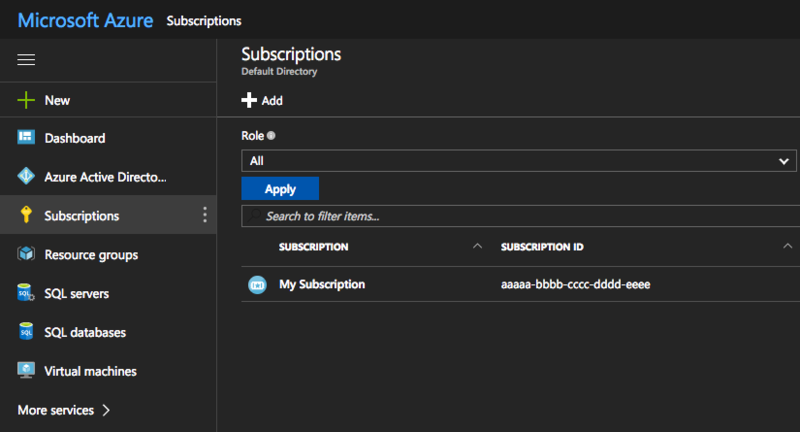 Since Azure integration supports multiple subscriptions, repeat the above permission configuration for any subscription you would like to monitor. Again, make sure that the region, service, and tag are properly configured in addition to the Tenant ID, Client ID, and Client Secret from Mackerel’s configuration screen. This concludes the integration method using Azure Portal. Specify the tag from Mackerel’s configuration screen. Confirm the number of integration hosts and save. If you specify the tag like service: foo, service: bar, instances that allow tags with a key of service and value of foo or tags with a key of service and value of bar will be targeted. If the key or value includes a comma , etc., enclose it with quotations ("or '). For example, if the key is service, role and the value is foo, bar, specify "service, role": "foo,bar”.